Diecast, Kits, Railway, Slot Racing and RC Specialists Over 20 years in the model trade. 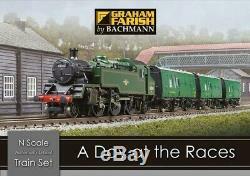 Graham Farish 370-185 A Day At The Races - N Gauge Train Set Yes it's in stock! This is a complete set - train, track, controller etc. Many of Britains horse racing tracks and towns were served by substantial railway stations providing facilities for both passengers going to the races and the horses taking part. Race horses travelled in specially constructed horse box wagons based on 4-wheel coach chassis for smooth riding at passenger train speeds and having a compartment for an attending groom. This train set features one of these race horse specials, hauled by a British Railways class 3MT 2-6-2 locomotive in the lined green livery applied to many of these engines in the late 1950s along with a train of three horse boxes painted in the Southern regions' coach green livery. The set is completed with an oval of track along with a point and a short siding, allowing the horse boxes to be shunted and uncoupled for loading/unloading Contents: - Standard Class 3MT 2-6-2T 82001 in BR green with late crest (6 pin socket for DCC conversion) - Pack of 3 Mk1 Horse Boxes in BR green - Oval of track with siding measuring 645mm x 506mm. Bachmann 36-560 controller & wall plug. NOT SUITABLE FOR UNDER 14s DUE TO SAFETY REGULATIONS. IMPORTANT - to avoid doubt - this is a N gauge set. The loco, track, etc etc is all approx HALF the size of normal "Hornby" size systems. On some products we offer a choice of 1st Class post - this typically takes 1 to 2 days but is not a time guaranteed service. All non-Express orders are dispatched in order of receipt. Waste Electrical and Electronic Equipment Regulations 2006: We are registered under the Valpac DTS WEEE scheme, member number 400017. Please dispose of your used electrical items at an authorised recycling centre - if you do not know where your local centre is, please contact the Recycle More scheme for further information. VAT: All prices include VAT at the current rate. We operate under a point of sale system and do not issue VAT receipts with every sale. Supplier text and images used with UK distributor's permission where appropriate. The item "Graham Farish 370-185 A Day At The Races N Gauge Train Set" is in sale since Wednesday, April 10, 2019. This item is in the category "Collectables\Model Railways & Trains\N Gauge\Locomotives". The seller is "timetunnelmodels" and is located in Fenton Barns, East Lothian. This item can be shipped to United Kingdom, Antigua and barbuda, Austria, Belgium, Bulgaria, Croatia, Cyprus, Czech republic, Denmark, Estonia, Finland, France, Germany, Greece, Hungary, Ireland, Italy, Latvia, Lithuania, Luxembourg, Malta, Netherlands, Poland, Portugal, Romania, Slovakia, Slovenia, Spain, Sweden, Australia, United States, Canada, Brazil, Japan, New Zealand, China, Israel, Hong Kong, Norway, Indonesia, Malaysia, Mexico, Singapore, South Korea, Switzerland, Taiwan, Thailand, Bangladesh, Belize, Bermuda, Bolivia, Barbados, Brunei darussalam, Cayman islands, Dominica, Ecuador, Egypt, Guernsey, Gibraltar, Guadeloupe, Grenada, French guiana, Iceland, Jersey, Jordan, Cambodia, Saint kitts and nevis, Saint lucia, Liechtenstein, Sri lanka, Macao, Monaco, Maldives, Montserrat, Martinique, Nicaragua, Oman, Pakistan, Peru, Paraguay, Reunion, Turks and caicos islands, Aruba, Saudi arabia, South africa, United arab emirates, Ukraine, Chile.